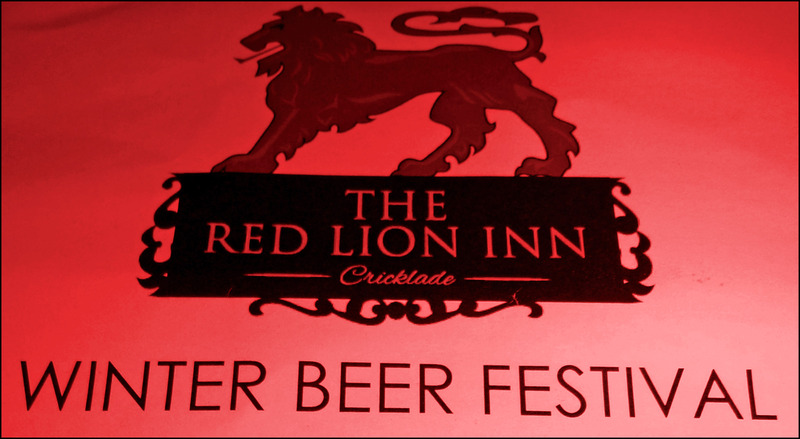 The first of what will hopefully be many Winter Beer Festivals taking place at the Red Lion in Cricklade. Friday nights are always busy at the Red Lion and the beer festival would undoubtedly make this one busier than most so was I mildly concerned. The Red Lion is a great pub but no pub is great when it’s overcrowded. But I shouldn’t have been concerned because Tom and his crew know what they are doing. I should have known they would have a plan and that the plan would be a good one. The beers were served from inside the Hop Kettle brewery, onto which a spacious and heated marquee was attached – spacious enough for several picnic benches coupled with plenty of standing room. The extra space was great but the real value of the marquee was the fact that it allowed the beer to be sold from inside the brewery – an excellent touch that gave the festival an extra stamp in the cool column. Another excellent idea was to have a wall of the marquee that doubled as a beer info point: each beer had a landscape piece of A4 paper on the wall which featured a print out of the pump clip art and tasting notes. There were printed programs available but the info wall served as a focal point that brought people together to share likes and dislikes and have a general chat about beer and whatnot. Twenty five beers were up for grabs – 22 cask and 3 keg – alongside seven ciders. Cask beers were from (among others) Arbor, Dark Star, Hawkshead, Roosters, Tiny Rebel and Wild Beer. The 3 keg beers were Anchor’s Flying Cloud Stout (Zymaster Series No.3), Burning Sky’s Saison a la Provision and Barrel Aged Sunturnbrew by Nøgne Ø. All in all it was a pretty impressive list. I started with a Hop Kettle Flapjack Black (Buffalo Trace BA). The original Flapjack Black was by far my favourite beer of 2013 so I was keen to see what being stuck in a bourbon barrel for four months had added to the mix. I couldn’t help feeling a little disappointed. If I’d never had the original unadulterated version I’m sure I’d be raving about the BA version. But I felt the bourbon barrel smoothed off the jagged curves a touch too much. I like my breakfast stouts to be a little bit rough and uncompromising, which I why I feel it’s a style that always works better from the cask than it does from the keg. It was a disappointment. Not a true disappointment. Just a disappointment when compared to its illustrious predecessor. Like comparing Adventure to Marquee Moon. Next up was a genuine disappointment: Bourbon Milk Stout from Sonnet 43. It tasted like a weak JD a coke that had been left on the mantelpiece overnight. The overall condition of the beer was fine but the taste wasn’t to my liking. Third up to bat was Old Stock Ale from Tiny Rebel, which was far fruitier than I was expecting it to be despite the tasting notes stating it was fruity little number. It was just the lift my senses needed. Time to switch to keg! Burning Sky are a brewery that folk have been shouting about for several months… and even several months before they had a beer on sale. When I turned up at the Red Lion Winter Beer Fest I still hadn’t tasted a Burning Sky (Call yourself a Beer Geek!?) Time for that to change. If Sorachi Ace is the hop that splits the beer community, Saison is the beer style (It’s not a style!) that splits the community. I like saisons but I’ve begun to grow slightly mistrustful of them as some breweries seem to chuck out a new one every other week. But Burning Sky’s a la Provision is a great example – a slightly sour liquid sherbet with a definite Belgian yeast hit. Lovely. After a couple of palate fresheners it was time to return to the dark and moody beers. Time was now against me as my designated driver wanted to get to the fish n chip shop before it closed at 10. I nipped back to the bar for another dose of Flapjack Black and decided that despite my earlier appraisal it warranted a growler fill. Then the party was over. There was a great crowd at the festival. Several people I know. Several people I recognised as Red Lion regulars (or at least irregular regulars like myself). And loads of people who were first time visitors. But, if the ones I chatted to are anything to go by, a fair few of those first time visitors will be returning to the Red Lion soon and often. And the local CAMRA party had a sizeable contingent in attendance. Great beer + a buzzing crowd = a perfect festival. The summer edition should be taking place in June – when a firm date is announced you should stick it in your diary.